New Posh signing Danny Lloyd with manager Grant McCann. Latest Peterborough United signing Danny Lloyd almost quit football altogether 12 months ago. 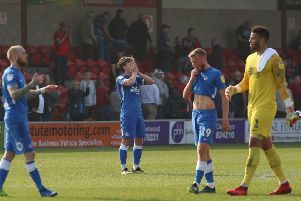 Lloyd had become disillusioned with the sport despite a terrific season with non-league Fylde, but he was talked around by Stockport manager, and former Posh boss, Jim Gannon who signed him on a one-year deal. Former Posh manager Jim Gannon. Lloyd signed a three-year contract with Posh earlier this week. “I’d fallen out of love with football,” Lloyd said. “I was thinking of packing it all in, but Jim Gannon spoke to me last summer and rebuilt my confidence. “And 12 months later, I’m in the Football League. Gannon was disappointed to lose his star player, but, speaking to the Stockport County website, said: “Our disappointment is diluted by what a great move it is for Danny. He is going to a club with great football people in charge and he should thrive under their care. I’m delighted for him.